AAPSEF Board President Omari Rush, DFCU Financial President and CEO Mark Shobe and AAPS Superintendent Dr. Patricia Green. DFCU Financial, Michigan’s largest credit union, is expanding its presence in the Ann Arbor community, with a new location now open at 2973 Plymouth Road. The credit union, which already has three locations in the city, celebrated its new location by donating $5,000 to the Ann Arbor Public Schools Educational Foundation on June 13. “In all communities in which we do business, we support the public schools by making monetary contributions as well as donating our time to teach financial literacy classes for kids,” said President and CEO Mark Shobe. The credit union has also developed the innovative “Schools and You” program to raise more money for the district. For every account opened or loan closed at the Plymouth Road branch, DFCU will donate an additional $25 to the AAPSEF. 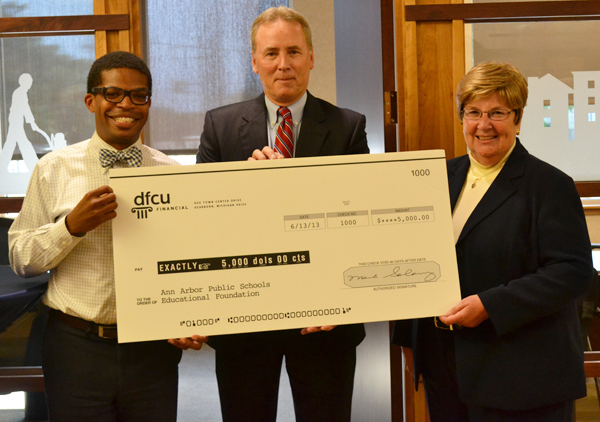 AAPSEF Director Mary Cooperwasser is thrilled with the support from DFCU Financial. Cooperwasser, who was appointed to the role of director in February, said she is also looking forward to forging more business partnerships with the foundation.